But the two were on hand for the 2019 touring band officially being called Mott the Hoople ’74, adding quite a lot, with Fisher doing a lot of tuneful musical introductions to some songs (including a teasing approach to “All the Way from Memphis”), and Bender taking off on some extended solos (although going bare-chested at 72 may not be the greatest idea). 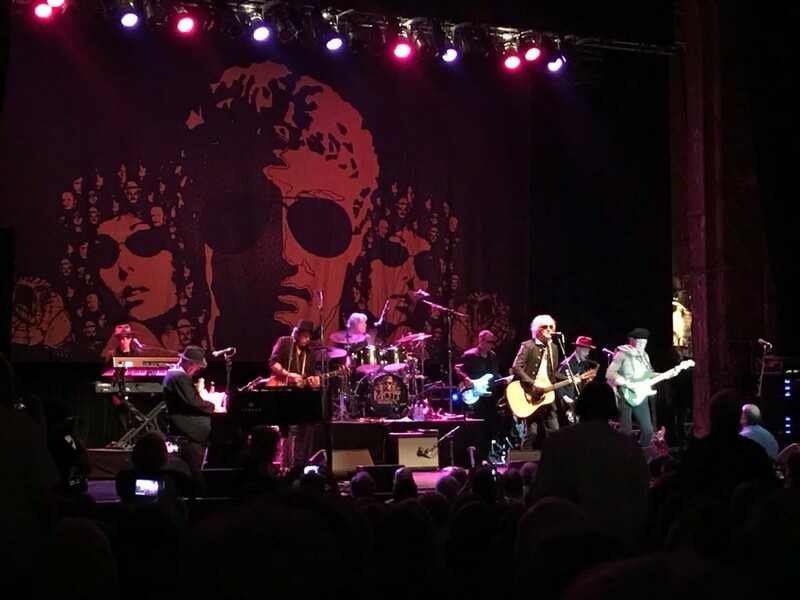 Once more it was fronted by the ageless Ian Hunter who rounded out the group with members of his own Rant Band, which includes James Mastro of the Bongos on guitar, sax and mandolin, and ex-Wings drummer Steve Holley on drums. It was an awesome eight-piece that made up for the impossibility of reuniting the previous edition of Mott — Buffin died in 2016 at 67; Watts died the following year at 69. Ralphs, who suffered a stroke in 2016, was hospitalized again earlier this year. The first voice heard at the top of the set (following a good opening campaign by the reunited Dream Syndicate) was none other than David Bowie, in a recording endorsing the band he saved from extinction by giving them his “All the Young Dudes” and producing the album of the same name. He began quite sincerely Don McLean’s hit about Buddy Holly and his widowed bride until the line about the day the music died. “Or did it?” he interrupted, before the band tore into “The Golden Age of Rock ’n’ Roll,” a song that didn’t so much celebrate the past (then less than 20 years before) as prop up the original inspirations as alive in the moment. “Gotta stay young, you can never grow old,” Hunter sang out, his voice as authentic a rasp as it was in the day. That made way for all kind of ‘50s dabbling, from Ray Charles’ “Mean Woman Blues,” to Chuck Berry’s “Johnny B. Goode” — Hunter reminded the crowd he had seen Buddy Holly and Sam Cooke in ’57, as if serving as a conduit for the entirety of rock ’n’ roll from the beginnings until today. They closed by following a bit of their own “Violence” with the one song that was outside the time period, a variation of Hunter’s 1979 “Cleveland Rocks” to also include every other stop on the truncated tour so far: Milwaukee, Minneapolis, Detroit, Chicago and Detroit before landing on Philly, where, 45 years earlier, they played the Merriam (then known as the Shubert). (The tour concluded following dates in Boston and New York).